Hello and good morning! Hope you all had a great weekend and are ready for the very rainy week ahead. We have cloudy skies and temperatures in the low-50s. The roads are dry, but that won’t last long. 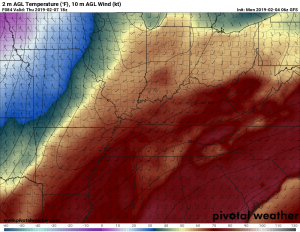 A cold front will be moving in today. Along with this cold front, expect high wind gusts and rain showers throughout the day. The temperatures is not expected to vary much from the weekend, as the highest temperatures will increase into the mid-60s and the lowest temperature will decrease into the low-50s. The 20 mph wind gusts will be followed by the cold front, which is timed to hit south-central Kentucky late tonight. Rain will keep ahead of the front, however, so expect rain around noon today. Cloud cover will remain high and rain chances will remain, but the winds will start to die down. While the winds are calmer, the rain will start strong, then fizzle out. The temperatures will reach into the low-60s early on in the day, then start to drop by noon tomorrow. The air will feel a tad cooler, due to the northern shift after the cold front. Make sure to have another jacket handy, just in case you feel a little colder. Showers will continue into Wednesday and the winds will start to take on more of a southerly turn. 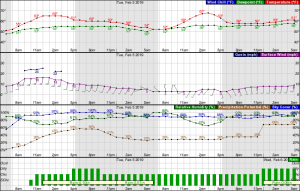 Winds will start to pick up and thunderstorms are expected Wednesday night. 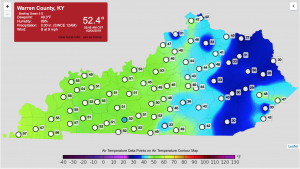 The temperatures will start in the mid-50s, then rise into the high-60s. The rain looks pretty constant, however, the daily temperatures will start to rise into the 70s. Strong southerly winds are predicted which will add to the warm-up. A cold front will go through on Thursday and will be bringing colder temps into the area. The forecasted high is determined to be in to the low-4os and the low being in the 20s..
As you read, we have shower chances all week. Temperatures will range in the 60s, possibly reach into the 70s for the beginning of the week, however, they will drop on Friday. You all have a great day and get ready for this very rainy week ahead. Come on back tomorrow for an updated version of this week’s forecast. Also, follow @wxornotBG for live updates throughout the day.